We made the decision to carry out the Student Led Teaching Awards project for the first time this year in order to celebrate the good practice and recognise the hard work our lecturers provide for our institution. We were looking for positive nominations and responses from our student body to celebrate good practice and recognise the lecturing staff that have a positive and effective impact on our students’ university experience. The Heart of the University Award was designed to recognise the many pastoral staff we have at Marjon. Varying from our Student Support department to Catering, we decided it was a must to have an award that identified our dedicated staff who, although they are not based in the lecture theatre, still adds value to our students’ experience. We wanted the Student Led Teaching Awards Project to be heavily student led. Therefore we proposed the idea to our student representatives at our Student Experience Council, for them to help with the leading of this project. The reps were encouraged to promote the nominations procedure as much as possible and our nominations panel where made up of 6 of our student reps in order to reach a final decision for each award, three from each faculty. In order to promote this project we bought two mascot costumes, a lion and a lamb, which students can relate to as they are a huge part of our university crest and heritage. These mascots would roam around our institution ‘looking’ for something. 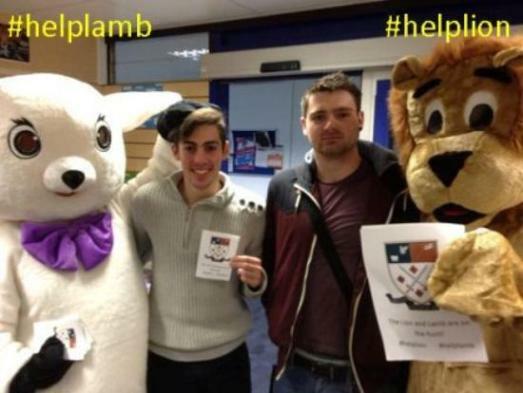 They would wander down corridors and into classrooms looking under tables and chairs handing out leaflets with our project Twitter hashtag of #helplion and #helplamb. This created a buzz around campus which we left for a couple of weeks before informing our students what they are looking for. When the time came we realised on our social media sites that the Lion and Lamb were in fact looking for outstanding lecturers and good teaching practice. This is when we gave out the award categories and criteria and the nominations began. Our results show that our students focused heavily on pastoral care here at the University of St Mark and St John. Pastoral care is hugely important within our community and current academic climate, and as a Student Union we are pleased that the results show a reflection of what our students deem important, as well as fitting with the latest HEPI/Which report that students are requiring more contact hours and smaller class sizes. This also fits with our University ethos and our emphasis on community feel within Marjon. We have thoroughly enjoyed working with NUS to produce the Student Led Teaching Awards here at Marjon Student Union. We are pleased to have introduced the project here at the University of St Mark and St John and hope it continues in the future.